A song about three deaths: Johnny Ace, who killed himself in a shooting accident in 1954 when Paul Simon was 13; John F.Kennedy, assassinated in 1963; and John Lennon, murdered in 1980. This live performance took place during the Simon and Garfunkel concert in Central Park in 1982, two years after Lennon's death. When someone rushes on to the stage yelling "I gotta talk to you", there is real danger in the air. These baths stand on the edge of the Welland meadows in Stamford, and incidentally mark the outer wall of the castle once built to protect the river crossing. I had assumed the elegant building once housed a fashionable spa, but it turns out to have been home to public baths built because of the poor sanitary conditions in the town. Yet Stamford did once have a medicinal chalybeate spring and today I found it. It is in those same meadows, but some way out of the town. You can find it near the bridge that takes the A1 over the river. An online forum carries memories of childhood Sunday walks to the spring to fill bottles. I have found a video that gives the history of the spring and explains why it is now dry. I will post it here one day. In the mean time, here are the photographs of it I took today. The nearby weir is part of Tinwell pumping station, that sens water from the Welland to Rutland Water. Mike Smithson has written a post on Political Betting looking forward to next month's local elections. Interesting 3 hours on the doorstep this afternoon (and no, people don’t mind being canvassed at Easter) in deepest Surrey. 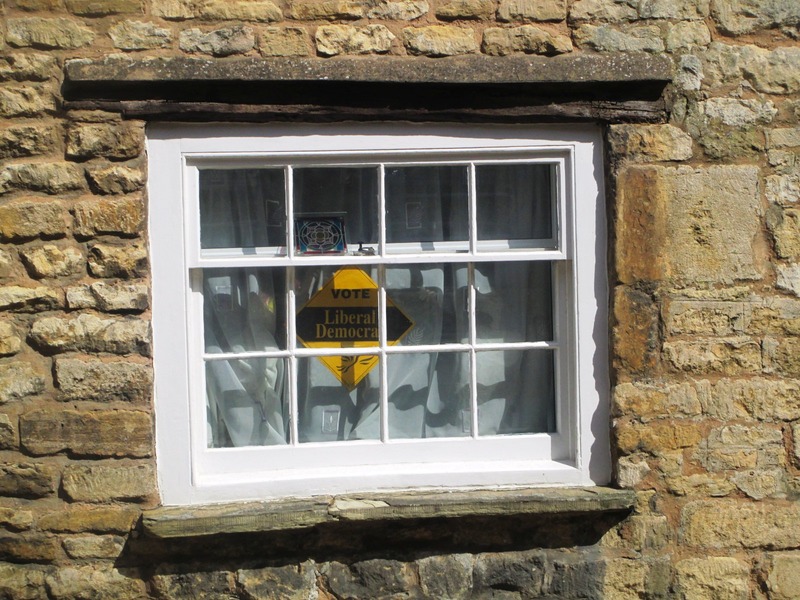 I think the Lib Dems are going to do well – I’m used to their voters showing up as don’t knows till the last minute, but there’s some definite enthusiasm out there. Labour's core vote seems solid but not especially enthusiastic – it’s mostly about fighting the Tories. The Tory vote is crumbling at the edges – unusual number of former Tory voters going out of their way to say they wouldn’t ever vote Labour but definitely not Tory any more either – even met some Brexiteers voting Lib Dem as an anti-big party protest. But the Tories too have a core vote which is loyal – I don’t expect a real meltdown. Palmer sat for Broxtowe between 1997 and 2010. It's time to join the daddy of psychogeographers, Iain Sinclair, on another walk. This time, says the blurb on YouTube, he follows Vincent Van Gogh's daily walk to work from his lodgings in Hackford Road, Brixton, to the gallery in Southampton Street, Covent Garden, where he worked as an art dealer. We go inside the house in Hackford Road, which is currently being restored by Livia Wang of San Mei Gallery. The film coincides with the Tate Britain exhibition Van Gogh and Britain, which runs until 11 August. When you are young you feel the built world around you is permanent and you are ephemeral. If you are lucky you live long enough to realise that, while you go doggedly on, that world is in flux. Take the two primary schools I attended in Hemel Hempstead. I have found a photograph and a drawing of the old Boxmoor school and put them on this blog. But I have never seen a photograph of Fields End, which was one of celebrated concrete-and-glass schools that Hertfordshire County Council built after the war. And what does the photograph above, which I took today, have to do with all this? Not so long ago this would have been dull to me too. It is a scene I see every working day: unremarkable modern rolling stock passing through my local station. East Midlands Trains has lost the franchise to operate the St Pancras main line, which means its livery will soon be a thing of the past. Suddenly this train looks interesting,and in 10 years' time it will be far more interesting. And the track it is one will soon be a thing of the past too, alignment lost under an extended station car park. At the start of June trains will be calling at the new platforms that are currently taking shape. Mary Colwell says a GCSE in Natural History could be the first step in a revival of nature in our education system. Whenever I listen to Brain of Britain on Radio 4 my sense of inadequacy grows as the programme progresses. I simply don’t know that many facts. In March, I caught the first heat in the quest to find the greatest knowledge-guru of 2019 and I barely got off the starting blocks. Maybe I could have answered one or two questions given more time, but I can’t recall fast enough. I hugely admire those who have this kind of info sitting in an accessible part of their brain. Then, one of the questions was on natural history. The question master, Russell Davies, asked, “Daubenton’s, Brandt’s and Leisler’s are three species of which British mammal?” The answers proffered were hedgehog, otter, badger and shrew. I found this surprising. Brandt’s and Leisler's are not as well-known as Daubenton's, but I was taken aback that not one of the highly intelligent and well-informed contestants guessed, or knew, they were bats. It was equally surprising that they thought there was more than one species of hedgehog, otter and badger in the UK. This observation is in no way meant to put down the people taking part in the programme, but it did highlight that the names of common British mammals are considered specialist rather than common knowledge. Why is this so important? Is it simply enough to know there are bats and badgers? Or is it useful to know that there is only one species of badger in the UK, but there are 18 species of bat, 17 of them breeding here? And – is it important to name them? I think there is a good argument for doing so. When a creature is named it is conferred autonomy while at the same time we affirm its place alongside the rest of the nameable world. If we care enough to name something, we might be more inclined to embrace its existence alongside our own. Conferring the dignity of a name allows us to embrace the creature as familiar - the root of empathy. Understanding, familiarity and empathy are essential for a fully-human, holistic and meaningful relationship with the world. As an example, that flitting shadow seen over the local park lake on a summer night is not just a generic, flapping animal, it is a bat. More than that, it is a Daubenton's bat, a fascinating creature that is sometimes referred to as a ‘water bat’ because it skims over the surface of water bodies feeding on insects flying close to the surface. Sometimes it scoops them up with its large feet. After one night’s feeding it can increase its body mass by over 50 per cent. Daubenton’s bats spend the winter in caverns underground, adding further mystery to their nocturnal lives. A Pipistrelle bat, on the other hand, is our smallest and commonest bat. 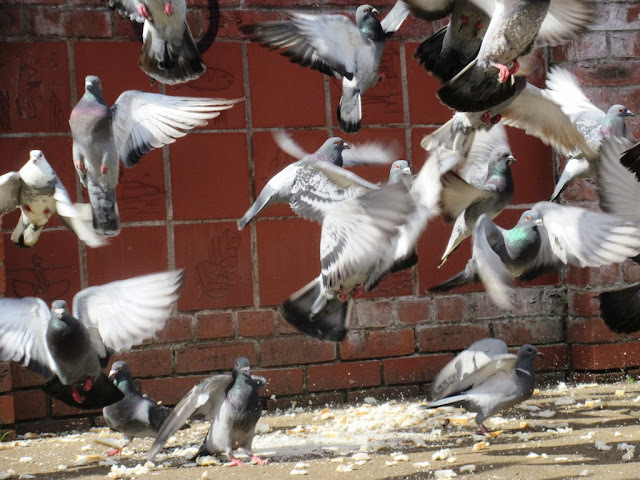 It is often found in urban settings and the one you are most likely to see in the garden or roosting in your roof. It can live in colonies of over a thousand. Names matter if we want to add richness to our understanding of the world. Bats, along with other wildlife, are not just biological specimens. They come marinated, as it were, in folklore and cultural attitudes. We are creative and inventive creatures, we love stories, and have long gazed at the life that accompanies us on our journey on earth and have conjured up all manner of associations. Bats fly at night, at a time when we find it hard to see. We are easily scared by a flitting, frantic shadow. It is no surprise that bats have been, and still are, connected by our inner fears to death and the mystery of the unknown beyond life. Films about vampires and distressed souls feature bats to add a shock factor tinged with the unknowable. To see a bat is to observe a flying amalgam of story and scientific fact. The animal that streaks past the streetlight seems to bring forth a range of emotions that enhance our existence. Names matter, associations matter. Without the ability to look at the natural world around us and be able to name it and give it a place in our cultural lives, we become diminished. In 2011, I came up with the idea of a GCSE in Natural History. It arose from a realisation that the world is unfamiliar to so many. Although we live here, breathe the air, eat what is grown in the earth and watch programmes that celebrate the natural world, many people know little about their surroundings. This was not the case 50 years ago. There has been a steady erosion of the rock that kept us stable on the planet - our understanding of nature and our place in it. After a couple of attempts to drum up support, including a government petition in 2017, it wasn’t until Caroline Lucas, the Green MP for Brighton Pavilion, contacted me to ask if she could help that the idea was transported into the corridors of power and progress is being made. A GCSE in Natural History isn’t just a qualification in naming things, it is a course that provides young people with the ability to observe, record and name the planet. It will teach them to work with the realities of a messy, unpredictable world and be able to use the data they collect. It will require patience and an ability to think outside the box. It will sharpen the senses and broaden horizons. It will require an understanding of biology, geography, maths, English, technology and outdoor pursuits. It will also, crucially, connect the natural to the cultural world through the relationship between nature and art, music, literature, poetry and digital media. A GCSE in Natural History will bring the nature into the heart of the city, the town and village. It will start to nurture those weakened connections to the living world that have been so eroded through the 20th Century. If the GCSE is established then the school system will begin to gear up to prepare children through the primary and early secondary years. It may go on to an A Level, and who knows, I’d love to see degrees in Natural History. The late and very great Aubrey Manning had the esteemed title of Professor of Natural History at Edinburgh University. I’d like to see those positions in every learned establishment. A GCSE in Natural History is the first step in what I hope will be a revival of nature in our education system. Mary Colwell is a producer and writer specialising in nature. The end of another week with Lord Bonkers. I have the feeling that, however things turn out, the old boy will continue to thrive. To be candid, I haven’t the faintest idea what will have happened by the time you read this. As to what Brexit will mean for Rutland, I can foresee only an outbreak of criminality. Where there are borders and tariffs, smuggling inevitably follows. Someone hereabouts will make a great deal of money out of it in the years to come. It’s a good thing I am such a morally upstanding fellow. I did not feel up to travelling on Saturday, but I wanted to take some photographs. So I explored Market Harborough. Well, Little Bowden actually - a village that was long ago absorbed by the town. The same thing is in the process of happening to Great Bowden today. One quirky fact about Little Bowden is that it used to be in Nortbamptonshire. The border between Northants and Leicestershire used to be the Welland, but by the 1890s there had been enough new building south of the river to annoy the tidy minded. You can still see, in Northampton Road, what used to be the police station and magistrates court for the part of Market Harborough that was in Northants. 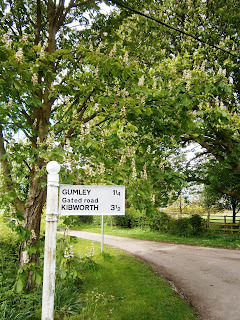 So the border between the counties was moved a mile or two to the south, so the whole of Market Harborough and Little Bowden, my house with them, now lay in Leicestershire. 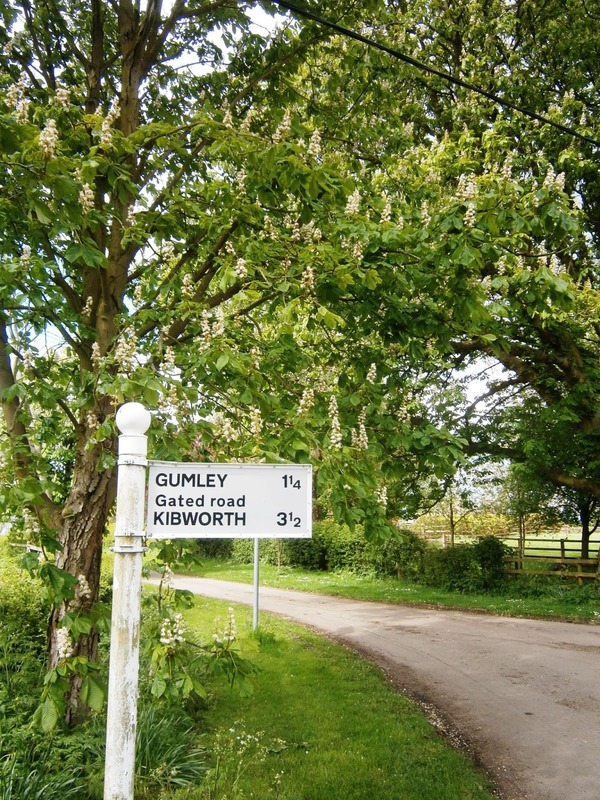 The same act got rid off the enclaves of one county that were to be found surrounded by another across England. A Wikipedia article on Worcestershire shows just how complicated the picture could be. Anyway, this is how Little Bowden looks today - not forgetting our new footbridge and a local cat. I have found myself wondering recently whether people holding giant orange diamonds behind Lib Dem notables just look silly. It seems Lord Bonkers agrees with me. When we do have a new leader, he, or indeed she, will have to something about our membership cards. I admit it makes an impressive photograph when one of our candidates stands in front of a bank of card-carrying members, and you can see a fellow Liberal Democrat coming down the street a mile away. But are those giant orange diamonds practical? They do take up an awful lot of space on the bus, for instance. Wouldn’t we rather have something you could just slip into your wallet? After all, in these straitened times not everyone has domestic staff to carry his card for him. Good news from an openDemocracy article on wards with only a single nominated candidate in next month's local elections: the Liberal Democrats are guaranteed 11 victories. The less good news is that there are also 5 seats with just an Independent candidate, 17 with just a Labour candidate and 267 with just a Conservative. Such non-contests have always been a sad fact of political life in this part of the world, so I am not surprised to learn that the East Midlands has more of them than any other region. It turns out, under first past the post, it’s often true – and parties take note, refusing to put resources into ‘unwinnable’ seats. That means whole areas can become electoral wastelands, with voters ignored and denied real choice. As we’ve seen this can – at the most extreme – lead to parties not even bothering to contests seats and denying voters even a token say in who represents them. This is why today we see we see hundreds of councillors - nearly all Conservatives - measuring the curtains in town halls across the country before polling day has even begun. A sign of just how dysfunctional our electoral system has become. Later: There may be even more uncontested seats than suggested here. I am told that in Oadby and Wigson there are three three-member wards with three Lib Dems and only one Conservative standing. So we are guaranteed six successful candidates before a vote is cast. Later still. I am also told that there is a seat in Lincolnshire with no candidates at all. Cleopatra's Needle was first erected in the Egyptian city of Heliopolis by on the orders of Thutmose III, around 1450 BC. In 12 BC the Romans moved it to Alexandria and set it up in the Caesareum – a temple built by Cleopatra in honour of Julius Caesar. And in 1878 it was brought to London and the Victoria Embankment. I am afraid the old brute is not at all impressed by Britain's newest political party, I would not advise them to put up in the Bonkers Hall ward just yet. Last time I called in at the Lib Dem Whip’s office at the Commons, I found several of our MPs dressed in rucksacks and hiking boots. When I asked what they were up to, I was told they were off to deliver leaflets for something called ‘The Independent Group’. I was told, however, that the shaker and mover behind the group is one Chucky Umami, so I curled up with a pamphlet he has just published. It soon transpired that he is one of these hearty public school types who want to send the nation’s youth off to camp. Sleeping under canvass; washing up in a bucket of cold water; doing PT with your shirt off… You know the type. By the time I had finished reading, it I was clear that the man is worse than that. He wants to haul in the country every teenager off to the Jack Straw Memorial Reform School, Dungeness. Why in Gladstone’s name are our people delivering for him? There are just two foot crossings of London railways left, both on freight lines. One is on the one from Souithall down to Brentford and the other is on the line to Angerstein Wharf in Charlton. In the mean time, you can sign a petition against the closure. And you can watch the video above. Lord Bonkers' Diary: What are you doing with yourself these days? Lord Bonkers' tact and diplomacy are legendary - in the sense that everyone has heard tales of them but no one has ever seen them. So my old friend Vince “High Voltage” Cable is to throw in the towel and make way for a younger man or, indeed, woman as Liberal Democrat leader. All of which means that I rather put my foot in it the other day. You see, I met Cable by chance in London and had a long chat with him. Our conversation ranged over his boyhood in York and experiences as a young economic adviser in Kenya, before he regaled me with amusing tales of his time as whip of the Labour group on Glasgow City Council. How we laughed! Then we discussed the finer points of ballroom dancing: he is known as a dab foot at the Cha Cha and Rumba, while I have a lot of balls. Then, as I now see, I spoilt things by saying: “Tell me, old man, what are you doing with yourself these days?” No wonder he gave me rather an old-fashioned look when we parted. Having surveyed our new footbridge, I made my way into town. On a path near Little Bowden Green I came across a wood pigeon being observed with distant interest by a cat. Because of the sun I could not see exactly what was in the viewfinder, but the photo above had captured the scene. Then I had a look at the one where I had zoomed in on the cat. By the time I got to the bridge it had vanished. The Conservatives - in government and beyond - have stopped thinking about economics, says.Stian Westlake. "Despite the internal divisions he did keep his Party together. There was the impressive fourth election victory in 1992, and he revived the party’s social agenda. The economy grew continuously, and he bequeathed one of the best economic legacies to his successors." Kevin Hickson and Ben Williams argue that John Major's premiership deserves more credit than it is usually given. "Asian parents do their utmost and hammer a sense of worth and an unrivalled work ethic into their children because of the graft it took to get to these shores and knowing the fundamental truth that the quickest way to be accepted into a native culture is to be valuable to them. Be a doctor. Be an engineer. Be a Test match opener." Vithushan Ehantharajah on the fall and rise of Haseeb Hameed. 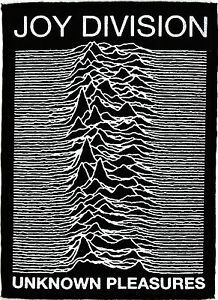 James Parker deciphers the mystery of Joy Division. Anne McLean follows the adventures of a young Victorian trainspotter: "The beautifully composed photographs are complemented by a set of letters written by George to his brother James in the mid-1890s. These tell us that his hobby outside school hours was photographing locomotives, especially the most modern ones for the time." A footbridge has finally appeared to replace the foot crossing at Little Bowden that Network Rail closed without notice four years ago. If I understood them correctly, Network Rail's concern was that the warning lights would sometimes be triggered by traffic leaving the sidings at Market Harborough. As some of these workings never reached the crossing, it was feared that people might start ignoring the lights. Those sidings have now been removed as part of the straightening of the line through Market Harborough station, so that problem has gone. But the crossing remains closed and we now have the footbridge. It is not a thing of beauty and manages to appear at once overengineered and inadequate to its purpose. Unlike the old crossing, it cannot be tackled by bikes, wheelchairs, prams, pushchairs or arthritic knees. But it has given us a new vantage point for railway photography. Now see what the crossing looked like in the 1980s. I managed to put him off yesterday, but I am afraid it is time to spend another week with Rutland's most celebrated fictional peer. He begins with some characteristically trenchant views. It turns out that he has been suspended for quite another reason. It has emerged that all those stories one heard about the appalling Cyril Smith were true and, what’s more, he admitted as much to Steel, who promptly did chuff all about it and later nominated him for a knighthood. No wonder E.W. Swinson was up in arms. Smith, whom I once described as “Extremely Large”, was one of many politicians I was at pains to keep away from my Home for Well-Behaved Orphans. There were times when I had a whole phalanx of gamekeepers deployed with their orchard doughties to keep these undesirables away. All power to this inquiry’s elbow, I say. Phil Knowles, leader of the Lib Dems on Harborough District Council, tells me East Midlands Ambulance Service senior managers are interested in his idea of a mobile stroke unit. He is pleased the proposal is being considered at this level and believes it would bring about a hugely important improvement in the response time for stroke victims, particularly those not close to specialist hospital facilities. "The location of the mobile stroke unit will, if it gets the go ahead, rightly be a decision for the professionals, but I think a rural location would be a strong favourite." As I wrote in that earlier post, a six-month trial of a unit in Essex was judged a success. The news now is that cuts to NHS funding mean it will not be used there any more, but there is interest in using it from elsewhere in East Anglia. I was very sad to hear of the death of the clinical psychologist Dorothy Rowe. I met her a couple of times and found her both kind and wise. Dorothy Rowe, who has died aged 88, was one of the earliest figures in psychology to build a bridge between the sometimes arcane world of clinical practice and the general public. 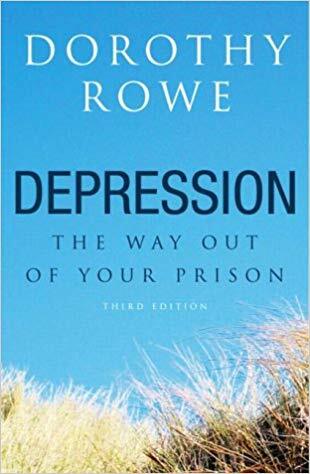 Coming to prominence in the 1980s, particularly with her book Depression: The Way Out of Your Prison, she made a career around the principle of listening to the patient in matters of mental illness rather than simply seeing them as problems to be solved – often by drugs or ECT, what Dorothy called “the equivalent of blood-letting”. Dorothy’s thinking centred on the idea that depression was not so much an illness as a crisis of meaning that could be addressed by rethinking the ideas that underpinned the so-called illness. This crisis was not necessarily to be found in childhood, or trauma – as Freud might have suggested – but simply in the necessity for all of us to build our own subjective mental models, which we then might insist were absolute reality, however high the price might be psychologically. You can also listen to her appearance on Desert Island Discs. The new issue of Liberator was waiting for me when I got home from work. So what's in Radical Bulletin, the section that tells you what going on in the Lib Dems? It explains why the Lib Dem spring conference in York voted to reject many of the proposed elements of Vince Cable's supporters scheme. though historians have scratched their heads, it has been hard to recall when the party establishment last took as monumental a kicking at conference as it did over the 'extras' to the supporters scheme in York. Was it Paddy Ashdown's prototype free schools in 1994, or the defence debate in 1986? Either way, something pretty unusual happened. 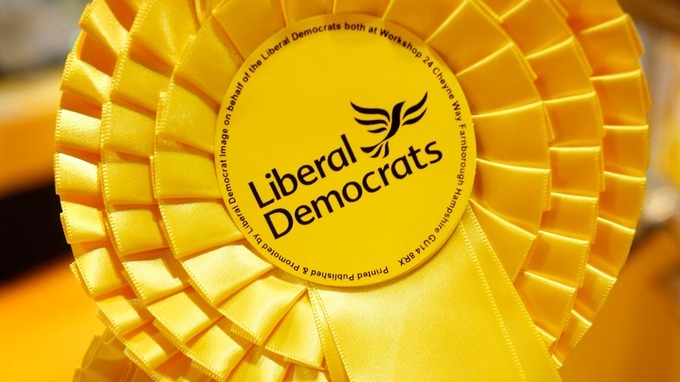 Radical Bulletin also reports claims of bullying and favouritism in the Young Liberals and an aborted selection in one of the Lib Dems' most promising target seats. There's the magazine's take on the potential contenders – with varying degrees of probability – as the next leader following Vince Cable signalling his retirement. And there are letters and reviews too. There is, of course, also Lord Bonkers' Diary, but I have managed to persuade the old boy that we need not start posting it here until tomorrow. Anyway, the conclusion is clear: you should subscribe to Liberator.